Here's Your Chance to Secure an "Instant" U.S. Vintage Gold Collection! 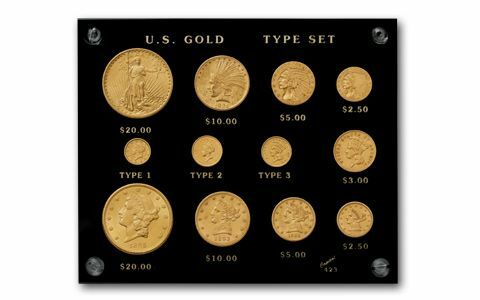 From the middle of the 19th century up until 1933, the U.S. Mint struck twelve different sizes and styles of gold coins. For decades, accumulating one coin of each type has been a collector's challenge. It's always been difficult, but it gets more and more difficult to complete this 12-Piece U.S. Vintage Gold Type Collection with each passing year. Through diligent effort, our buyers have assembled a small number of these complete type sets in high collectible About Uncirculated condition. We're pleased to make this set available for you to add to your collection and your family's legacy while there's still time. Each set comes in a hard plastic display to preserve and showcase your collection. Hurry and order yours before our small inventory is gone! 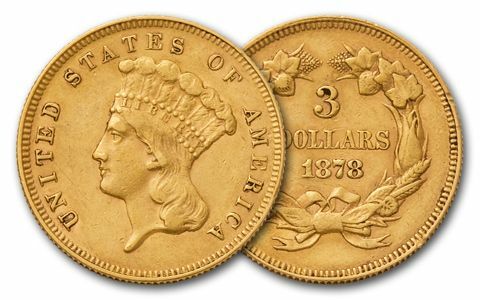 THREE $1 GOLD PIECES: There was never enough gold available for the mint to strike $1 gold pieces until 1849, when the California Gold Rush sent gold streaming into the mint. The Type $1 was struck between 1849 and 1854, the Type II for only a brief period between 1854 and 1856, and the Type III from 1856 to 1889. Because of their small size, many of these coins were lost. They can be very difficult to find today. 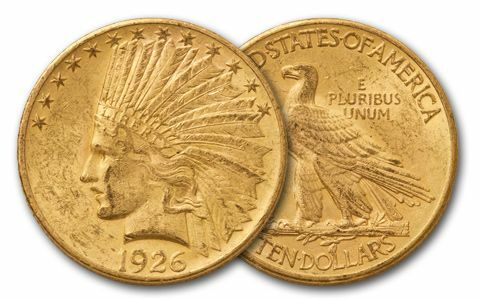 TWO $2.50 GOLD PIECES: The $2.50 gold pieces, also know as Quarter Eagles, were minted in two types: the Liberty Gold showing Miss Liberty wearing a coronet, and the Indian Gold showing a stately Native American in a feathered headdress. The Liberty was minted up to 1907, and the Indian, The first incuse design coin ever from the U.S. Mint, was struck between 1908 and 1929. THE $3.00 GOLD PIECE: This coin was created because postage stamps cost three cents each, and this one coin could purchase one hundred stamps! It features an Indian Princess in a pom-pom bonnet and is considered by many to be the most beautiful U.S. gold coin of the 19th century. They were struck between 1854 and 1889. These were struck in extremely limited numbers and are one of the most elusive U.S. gold coins in the set. 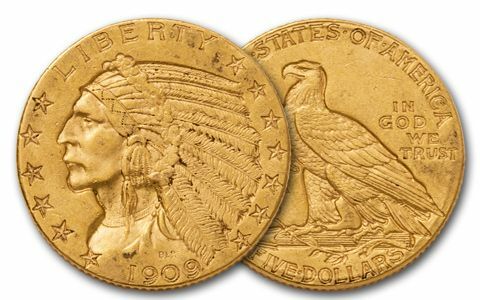 TWO $5.00 GOLD HALF EAGLES: The $5 gold piece was the workhorse of commerce in the nineteenth and early twentieth centuries. These were the most common gold coins in circulation, and consequently most wore down well below the About Uncirculated grades in this collection. The Coronet Liberty was struck up to 1907 and the incuse Indian—with its design struck below rather than above the coin's surface—between 1908 and 1929. 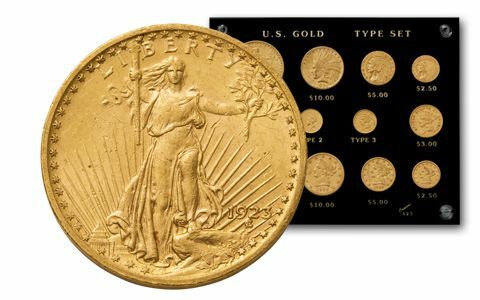 TWO $10.00 GOLD PIECES: The substantial amount of gold in the $10 gold piece—about a half an ounce—has made this hefty coin popular with collectors. The set includes the Liberty Coronet Gold piece struck between 1838 and 1907, and the spectacular Augustus Saint-Gaudens' design Indian Head $10 Gold struck between 1907 and 1933. The $10 Indian shows Miss Liberty wearing a superb feathered headdress. The design wowed President Theodore Roosevelt and it's been wowing collectors ever since. 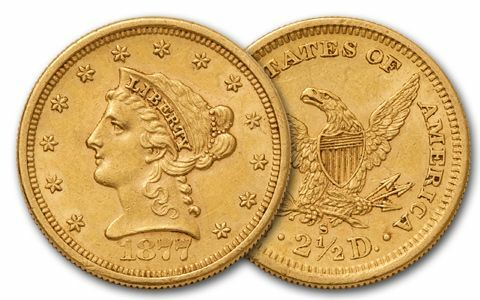 TWO $20 GOLD DOUBLE EAGLES: The $20 gold piece is the highest denomination, heaviest weight circulating gold coin ever struck by the U.S. Mint. It was also born out of the California Gold Rush. 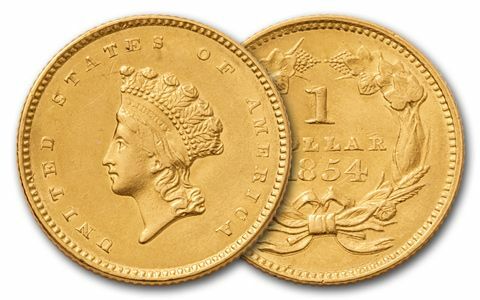 First struck in 1849, it utilized the massive amounts of gold flowing from California into the mint. 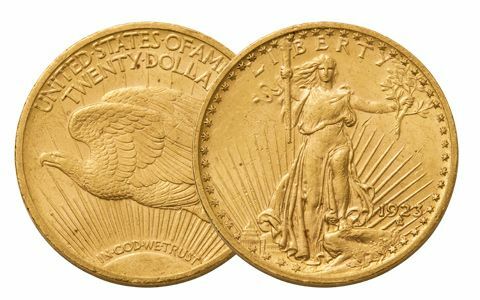 In 1907 the $20 Saint-Gaudens Gold Double Eagle replaced the Liberty Head version. Saint Gaudens' coin is a prize in it's own right, but tops off your gold type set nicely.